The John Smith's Grand National takes pride of place on Saturday at Aintree, but there are also six other excellent races. The £160,000 Baltika Beer Aintree Hurdle (2.50pm) and the £125,000 John Smith's Maghull Novices' Chase (2.15pm), both Grade One contests, have attracted 17 and 10 entries today. The former features Detroit City, trained by Philip Hobbs, and the David Pipe-trained Gaspara, who endured mixed fortunes when they appeared at the Cheltenham Festival last month. Detroit City went into the Smurfit Kappa Champion Hurdle having won his previous eight races including the totesport Cesarewitch on the Flat and the boylesports.com International Hurdle at Cheltenham. 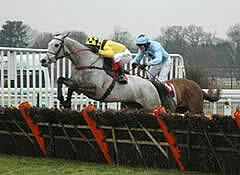 However, the 6-4 favourite was never travelling and came home a disappointing sixth behind Sublimity. In contrast, Gaspara gave the Pipe family a tremendous success when winning the Fred Winter Juvenile Novices' Handicap Hurdle. As well as being David Pipe's first Festival success, the winning four-year-old landed a £75,000 bonus as she had also scored in the Sunderlands Imperial Cup Handicap Hurdle for owner Martin Pipe, a multiple champion trainer before his retirement nearly 12 months ago. Black Jack Ketchum, a five-length winner of last year's Citroen C6 Sefton Novices' Hurdle here, is also entered in the Baltika Beer Aintree Hurdle, but trainer Jonjo O'Neill has indicated that he is more likely to run in Thursday's opening John Smith's Liverpool Hurdle. The potential Baltika Beer Aintree Hurdle line-up includes the Tom Mullins-trained Asian Maze, who has won at the John Smith's Festival for the last two seasons including in this race last year when she defeated dual Champion Hurdle winner Hardy Eustace by 17 lengths. Other possibles include Ladbroke Handicap Hurdle winner Acambo, also trained by Pipe, the Nicky Henderson-trained Afsoun, who was third in the Champion Hurdle, and four other Irish hopes in Al Eile, Jazz Messenger, Silent Oscar and Strangely Brown. The John Smith's Maghull Novices' Chase provides the Hobbs-trained Fair Along, Jack The Giant, trained by Nicky Henderson, and Nicky Richards's Faasel, who finished second, third and fourth behind My Way De Solzen in the Irish Independent Arkle Chase at Cheltenham, with another opportunity to secure a major prize. O'Neill's Don't Push It and the Paul Nicholls-trained Twist Magic were also going well and disputing third place when they both fell two from home in that championship event. Other contenders who ran in the Arkle are Pipe's Buena Vista, who was sixth, and the Howard Johnson-trained Lennon, who finished seventh but must have a chance as he is a dual scorer over fences at Aintree, where his victories include a 14 length win over Penzance in the Listed intercasino.co.uk Molyneux Novices' Chase in October. The possible John Smith's Maghull Novices' Chase field is completed by Irish challenger Rights Of Man, trained by Davy Fitzgerald, the Steve Gollings-trained Royal Shakespeare, who won the John Smith's Imagine Appeal Top Novices' Hurdle at Aintree in 2004, and Nick Gifford's Killaghy Castle. Saturday's opening John Smith's Extra Smooth Handicap Hurdle (1.45pm) attracted 48 entries, the John Smith's Extra Cold Handicap Hurdle (3.25pm) received an entry of 60, the John Smith's Novices' Handicap Chase (5pm) has 33 possibles, and the concluding John Smith's Champion Standard Open National Hunt Flat Race (5.35pm) has 34 entered.